When we moved to Spain with our dog Lizzie and her four cats, it didn’t matter whether we transported them as cargo or as baggage. Neither did it matter if we booked the trip ourselves or hired a pet transporter. The non-human members of our family were going to end up traveling downstairs in the airplane’s hold. Pet kennel requirements are fairly standard but do vary from airline to airline. Pet transport companies won’t supply a kennel. You may have to shop around to find the right-sized kennels for your pets. It will probably take several days to get your cats (and maybe your dog) to feel comfortable in a kennel. One thing that surprised me is that the pet transport companies won’t provide a kennel. The reasons they gave? Sanitary. Bizarre, I know. Durable, pressed plastic is pretty easy to clean based on my animal shelter world experience. Imagine if we only used a crate one time at the nonprofit humane society where I worked. Maybe not everyone has the necessary chemicals to kill parvo or other highly contagious germs, but wouldn’t you think there would a business there for a pet transport company? I know I’m not the only one who will probably use these kennels one time. And I spent a total of $656.00 on my five kennels. Two places led me to the information needed to ultimately purchase the pet kennels we used from the pettravelstore.com. Your airline’s website – once you’ve picked your airline, study their information carefully. These are the people you have to please. And I wouldn’t be a bit surprised if there isn’t some variance between airlines, particularly between US carriers and foreign carriers. The International Air Transport Association (IATA.org) — Everyone requires that kennels be IATA compliant. They must have metal doors, metal hardware, ventilation on all four sides, and food and water containers accessible from the outside. A kennel must be large enough so that the animal can stand without his ears touching the top of the kennel and he must be able to turn around comfortably. Kennels must be leak proof with absorbent materials in the bottom of the kennel (in addition, of course, to the padding you’ll add for your pet’s comfort. Before I chose pettravelstore.com, I had researched kennels from other vendors – both in local stores and online. The sizing varies by an inch or two so if your pet is an in-between size, it might pay to shop around. For example, I discovered that PetMate kennels are available from various vendors in slightly different sizes. One intermediate kennel was offered at 32″L x22.5″W x 24″H while another was offered at 32″L by 21″W by 25″H. One inch can make a difference. Not only do you want your pet to be comfortable and meet the requirements of your carrier, you also want your cost to be lower if you are flying your pets as cargo. The cost is based on the weight of the animal + kennel. You may end up in a different category if you can go into a smaller kennel. Finding the perfect sized kennel can take a bit of time. But don’t be too stingy. Think of the length of your journey. 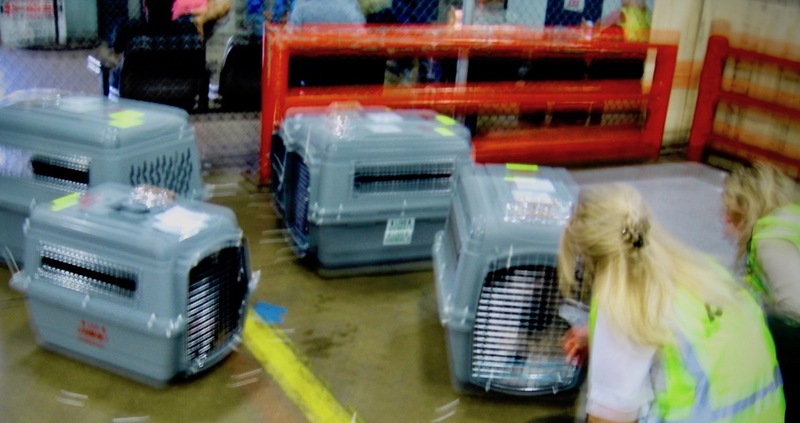 I picked a nonstop flight to reduce our journey length but our pets were still in their kennels for nearly 24 hours when you add car transport, all the waiting around in cargo at both ends, and the challenge we had in getting our pets released at our destination. One final thought. These kennels are designed for dogs, not cats. I chose a large kennel for my 45 pound dog. She’s thin but a little on the tall size so she just barely made the 27” height dimension of that kennel. The next size down was an intermediate. I bought two of those but they were too large for the cats so then I bought the final two kennels in size medium. To get the width and length I needed, the medium kennel height at 21.5” was far more than the 12-14” height I needed for cats. All the manufacturers I reviewed made kennels that are designed more for a long-legged dog. As one dimension increases, all the other dimensions increase proportionally. None of our animals were previously kennel trained unless you count the cats going to the vet in a carrier. Fortunately, none of our pets have an aversion to car travel. That certainly helped since we made a 2,000 mile car trip across the US before we jumped on the plane to Spain. On our road trip, the cats were given the choice of an open carrier or free riding. They chose everything but the carriers: my lap, the floorboards, on top of suitcases, and curled up close to Lizzie, our dog, who was ever so tolerant. We purchased our airline kennels about three weeks before the trip and started the acclimation process in the house by setting up one cat kennel. About one week before the trip we had all the kennels set up. Each animal was given their favorite treats in their kennel several times a day. We also did several short car rides with everyone in their temporary homes. Our cat kennels were big enough to house beds the cats were already familiar with. Per our vet’s recommendation we enhanced the bedding with old t-shirts with our smell. As a little extra insurance we purchased calming treats designed to help anxiety and nervous behavior. These treats may have worked on our dog Lizzie for the first few hours but I can definitely say they didn’t work on the cats because they refused to eat them. The cats did get a Feliway spray on their bedding. I’ve used this spray for years and believe it really works. For people unfamiliar with Feliway, it is a synthetic pheromone that mimics a cat’s natural facial pheromone to provide comfort and calming. Teej and the rest of the gang enjoy the coziness of the “used” kennel. We spent more than $650 on the five kennels we used to transport our pets to Spain and I thought it sure would be nice if they got used more than that one time. So Jamie left one assembled without the door — just to see if the cats had any lingering aversions. I’m surprised and happy to say the cats use that kennel every day. One cat or another, sometimes two at a time, will decide to take a break in the cozy confines. But the bigger surprise is that even our dog Lizzie squeezes in on a regular basis.